Thank you for visiting the Scott Jones Dance Boutique! We have a great selection of dancewear, shoes, tights, and dance novelty gifts. We have all your dancing needs. The Boutique hours are Monday – Thursday 4:00 – 8:00 pm. Please call the Scott Jones Dance Boutique at 744-7055 if you want to place an order. Caitlin shows off the back of the Scott Jones Logo Jacket in full crystals. 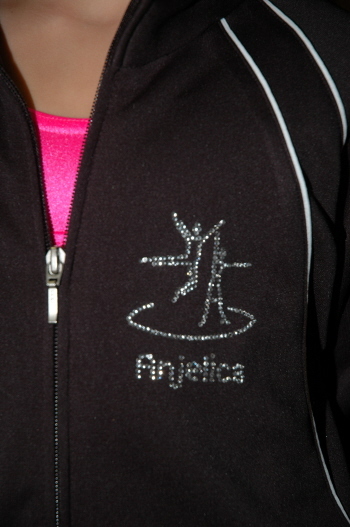 Anjelica shows off the front chest with the personalized logo.